Culture can play a vital role in local economic development. Culture is an increasingly common catalyst for local economic development, and the elusive confluence of artistic activity and property investment often generates “hip” neighborhoods. The Warhol Economy, a term coined by Elizabeth Currid in a book by the same name, refers to urban growth fueled by creative industries and their informal networks. However, culture does not always imply Warhol-like trendiness; it also embodies geographic, ethnic, and historic authenticity. With culture-based revitalization best left to natural evolution, neighborhoods can benefit from unexpectedly useful characteristics: fragmented property ownership and historical geographic disadvantage. In South Korea, Mullae and Gamcheon urban villages embody this paradox, and their experiences provide a roadmap for post-industrial growth. A common narrative about culture-based redevelopment is that artists are the “shock troops of gentrification,” a variously attributed phrase suggesting that high-rent growth occurs where artists have already chosen to live and work. Skeptics question the causality in this argument by noting that neighborhoods often gentrify without the presence of artists. Nevertheless, property investment has followed artistic growth in numerous cases. One example is New York’s Soho, where higher rents priced-out the artists who helped make the neighborhood desirable. In rare cases, however, artists themselves are responsible for displacement, and this is enabled by fragmentation – the presence of many small work spaces. The Hongdae area of Seoul has long been a hive of artistic creativity, known for incubating indie bands and aspiring artists in its once cheap ateliers. The neighborhood’s central location and proximity to a major university have made it a desirable residential and lifestyle destination, with a predictable rise in rents. Artists and independent businesses are now being crowded out by global chain stores and “mainstream” dance clubs. “Hongdae no longer has the color it used to have. It is losing its distinctiveness due to capitalism,” said a small business owner, quoted in a 2011 article in the Korea Times. This pattern is familiar to many cities: Itinerant artists are in a near-permanent state of displacement and relocation. In Seoul, some artists have adopted the industrial district of Mullae, where the once and continuing exodus of industrial activity has made cheap space available. Unlike the large-scale industrial facilities of Pittsburgh and Manchester, Mullae hosts a concentration of industrial shop-houses occupying small units often no larger than a single-car garage. This fragmented environment enables a rare and arguably counterintuitive phenomenon: the displacement of industry by artists. These small spaces are configured for few purposes beyond industrial production, and lack of alternative demand has historically kept rents low. Their size, cost, and flexibility suit the needs of artists, and the unexpected influx is now raising rents. This is good news for property owners but unwelcomed by remaining factory tenants. The area has now been labeled Mullae Arts Village and receives financial and institutional support from local government. Spatial fragmentation ripened Mullae for cultural growth, and the consequences present a unique opportunity to nurture an oddly-paired economic base. In addition to the availability of small and affordable spaces, historical disadvantages can also facilitate art-based neighborhood revival. Geographic isolation (difficulty of access), unattractive surroundings, and lack of a consumer market repel profit-driven commercial development. Given that artistic spontaneity is often sterilized by developer investment (which, paradoxically, seeks the same qualities through top-down planning), the absence of big-capital intrusion maintains accessibility for artists and other lower-rent tenants. According to a recent article about “high rent blight,” developers often tolerate vacant street frontage in otherwise profitable buildings, awaiting the highest-bid tenant – typically a global retail or service brand. Beyond blight, the absence of small independent enterprises also compromises a neighborhood’s uniqueness. In contrast, lack of large-scale development can keep property values low and spaces disaggregated. 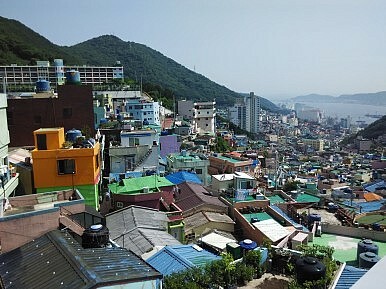 Gamcheon Village in Busan is one such place. Described as the “Santorini of Korea” for its pastel-colored houses and narrow alleys, this award-winning hillside neighborhood was born of disadvantage. Long home to the city’s poorest residents, it was once the center of a religious movement and later absorbed migrant populations during the Korean War. Gamcheon’s cultural transformation is recent but rapid; since 2009, government programs have encouraged artists to produce murals and installations, punctuating the neighborhood with offbeat curiosities. Art-splashed parks and creatively festooned houses lend the neighborhood an unforced ambience of authenticity. Gamcheon’s fragmented ownership, arguably the product of a difficult history and the resulting absence of development investment, has transformed seeming disadvantage into a platform for cultural expression. Without rent pressure from the commodified commercial landscape of shopping promenades and luxury towers – hallmarks of global economic prowess in Busan and other Asian cities – the scale of Gamcheon has remained human and the environment approachable. The potential of South Korea’s forgotten urban neighborhoods is hidden and unexpected. Mullae’s factory shop-houses represent a granular and accessible rental market that accommodates the flexibility needed for arts-based growth. Gamcheon’s historic disadvantage kept ownership fragmented and scale small, generating a platform for local and independent artists. These phenomena would not materialize in newer neighborhoods and suburbs, which lack the usage mix, zoning flexibility, and physical modularity to enable the fluid conversion of space for alternative purposes. These seeming disadvantages are now growth drivers in transitioning urban neighborhoods. A community of firms, particularly small and independent ones, represents a complex ecosystem of networks and interdependencies. This is true of both metals and the arts. Mullae exhibits a versatility that now accommodates two industries that are unexpectedly compatible. Similarly, Gamcheon has absorbed an artistic renaissance into an otherwise economically marginalized community. The planning of such neighborhoods must attend the interests of both the old and new, and can provide a template for rapidly developing Asian cities facing similar paradoxes. Kris Hartley is a visiting researcher at Seoul National University and PhD Candidate at the National University of Singapore, Lee Kuan Yew School of Public Policy.